Why and what to learn? Finance is a wider term which has great opportunities and it is one of the major pillar of any economy. You have an wide option to choose from to build a career in finance. If you love playing with numbers, then you are best suited for this career. Finance professionals not only enjoys a very rewarding and a reputed career, but these finance lessons also help them to make a better decision making in their daily life. This video will start from the very basic and will talk about the capital markets and its structures, various instruments of financial markets like stocks, bonds, commodities and currencies, different players of market, career mapping and many more. Finance being an important aspect in one's personal and professional life, hence these videos are suitable for people of all streams. 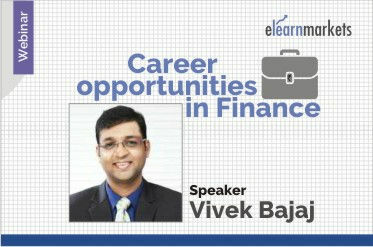 Vivek Bajaj is the Founder & Director of Kredent Academy & www.elearnmarkets.com. He has experience of more than 10 years as a trader - successfully implementing his option strategies in the currency & commodities market. As an industry expert he has taken on himself, the onus to train people on various aspects of financial markets.